Where there’s a three, there’s a one and two. Catch up there first. For the rest of our lives, when we look back on Disney 2010, we’ll remember Rafael. 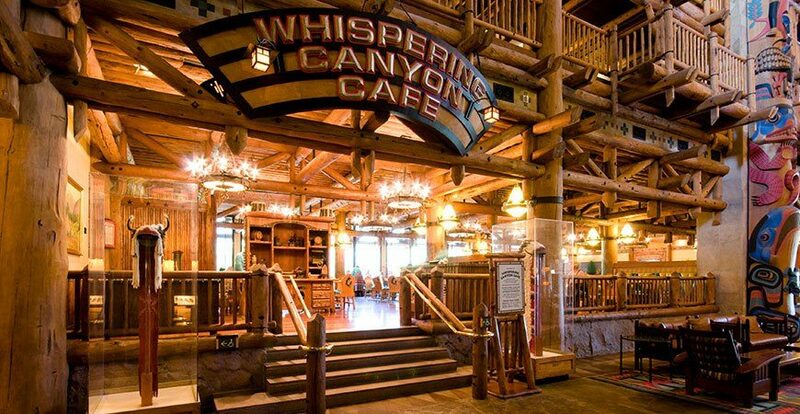 Rafael is a waiter at Whispering Canyon Café, a theme restaurant at Disney’s Wilderness Lodge. We made lunch reservations there because we’d heard that the wait staff is legendary for having fun with their guests. If you ask for a bottle of ketchup, you get ketchup from every table in the restaurant. If you’re caught stealing your kids’ fries, the waitress will stand on a chair and yell at you to order your own dang fries. Shortly after we were seated, a massive Puerto Rican came out of the kitchen and began to harass my kids. Throughout the lunch, he made them bus tables, hand out cell phone numbers to teenage girls in the restaurant, stand in the corner, and spend some time in the Whispering Canyon Jail. Merriem wasn’t exempt either. She ended up with a head full of a drinking straw hair weaves, courtesy of Rafael. 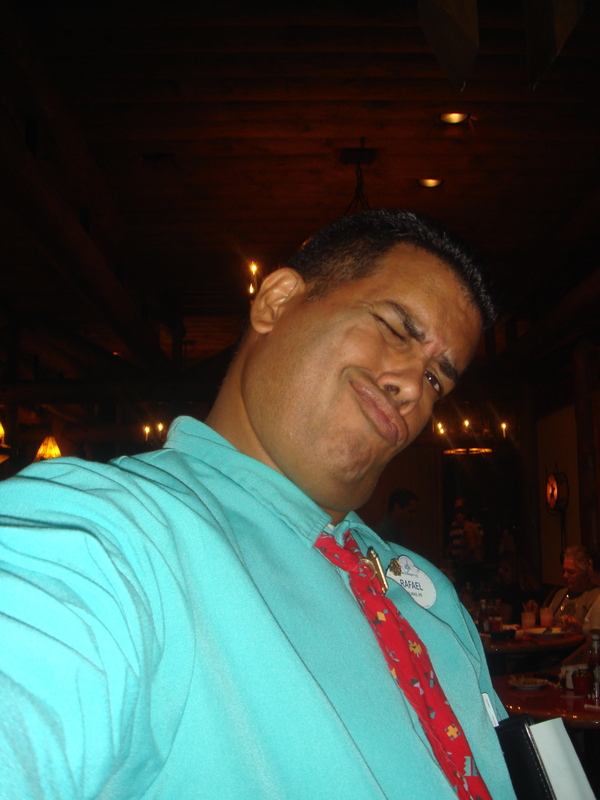 Rafael swiped our camera and took pictures of himself and others around the restaurant (that’s him in the pic). When I ran low on lemonade, he brought me a gallon jug with a foot long straw. He joked and teased and provoked us throughout the entire meal. We weren’t just a family of diners, we were the floor show. Rafael is an example of what we learn from Disney: You can’t force an experience, but you can set the stage for it. He didn’t have to treat us the way he did (the other servers didn’t come close to his people skills and his brand of fun). He didn’t have to spend the time with us that he did (he pulled up a chair – after kicking Jase out of it – and just hung out for a while). He didn’t have to act like we were the only customers he’d have that day. But he did. Rafael had no way of knowing if we’d had a good morning or a lousy morning. He didn’t know if we were a fun-loving family or straight-laced. He didn’t know if we’d roll with the punches or take offense. But he had one job, and that was to set the stage for a great experience. Every weekend, we deal with people who arrive with stories. Some are simple: they are looking for community, looking for truth, looking for meaning in life. Some are complex: they’re in the middle of high drama, broken relationships, and self-sabotage. But with every person, their story contributes to their experience. And their previous experience with churches will contribute to their expected experience with us. Just as a reminder, the primary experience the church should provide is an encounter with the gospel, and everything we do from the parking lot to the pews sets the table for the gospel experience. If a guy has had to deal with a surly parking attendant…if a mom is worried that the nursery worker didn’t understand that her child has an allergy…if a person can’t find the restrooms or connect to a small group…that detracts from the gospel. What Disney teaches us is that an experience (in their case, fun) can’t be forced. But it can be planned for and aimed toward. In the same way, we can’t force people to embrace the gospel. It’s not our job to do so. However, we can make sure that there’s not a single thing in their weekend experience that would distract them from the gospel. That is something we can do. That, and drinking straw hair weaves. I hear it’s the next big thing.